In an effort to improve the efficiency of the City’s Trolley service as well as enhance passengers’ transit experience, effective November 1, 2017, the City replaced Collins Link trolley service by the limited stop Collins Express trolley service. 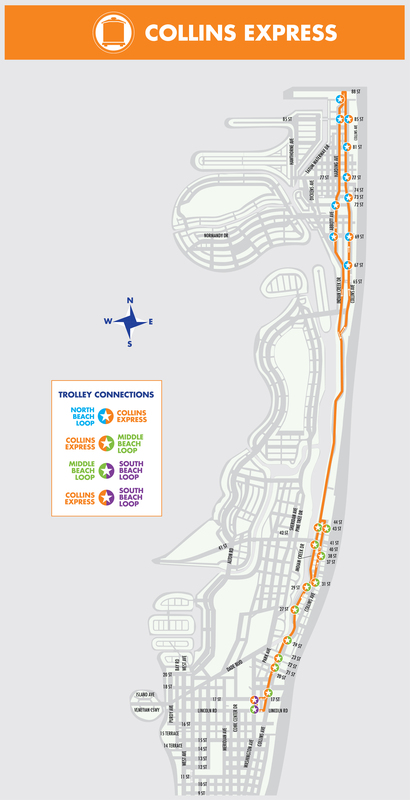 Collins Express limited stop service reduces the number of transfers currently required to travel between North Beach, Middle Beach, and South Beach, and reduces travel times, thereby resulting in a quicker and more attractive and efficient intercity trolley service. The new service is extended to Washington Avenue Lincoln Road on the south side and 88 Street on the north end. The frequency of new Collins Express trolley service is approximately 20 minutes. Collins Express serves all bus stops along Collins Avenue between 44 Street and 63 Street. South of 44 Street and north of 63 Street Collins Express stops only at selected stops. See route details below.